Epsom salt is scientifically known as Magnesium Sulfate. It is used as a natural remedy to relieve muscle cramps and pains, treat bruises, cure constipation, remove toxins from the body, and so on. Furthermore, it helps relax the body and reduce stress. Thus, it is used in various spas, too. Epsom salt is also edible, but in small quantities only. The clear white crystals of Epsom salt should not be confused with sea salt, which is extensively used in cooking, even in cosmetic products. 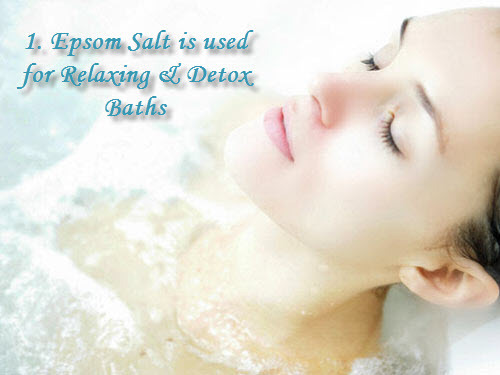 Epsom salt is one of the most popular bath salts used at home as well as commercial spas. When you soak in bath water mixed with minerals, the process of reverse osmosis takes place and it draws out salts and toxins from your body. Moreover, the sulfates present in this mineral compound increases the number of digestive enzymes in the pancreas that help flush out toxins from the body. Plus, magnesium elevates your mood (because it helps produce serotonin), improves concentration, relieves anxiety, stress, depression, fatigue, and even helps calm the nerves especially in case of individuals striving to detox drugs and alcohol. Magnesium sulfate purifies the body of heavy metals, too. As the stomach does not easily absorb sulfates and magnesium, the best way to derive their advantage is absorption through skin. So, you can soak in a bath tub filled with warm water mixed with about two cups of Epsom salt. You may also add a few drops of essential oils of your choice. Apart from detoxification, Epsom salt baths stimulate the lymphatic system, replenish electrolytes, ensure proper functioning of the nerves and muscles, and reduce grinding of teeth during night (bruxism). In addition, they are considered good people suffering from diabetes, high blood pressure, and heart problems. Studies have found that this salt encourages the production of adenosine triphosphate, thereby increasing your energy and stamina. Furthermore, soaking your feet in hot water mixed with this salt soothes sore feet, neutralizes foot odor, and treats toenail fungus. It is usually recommended to take an Epsom salt bath for about 10-15 minutes, up to three times in a week. Gently scrubbing and massaging your skin with a combination of a handful of Epsom salt and a tablespoon of bath oil exfoliates your skin by removing dead skin. You can blend the salt with baby oil or olive oil. It is particularly good for rough areas like the heels and elbows. 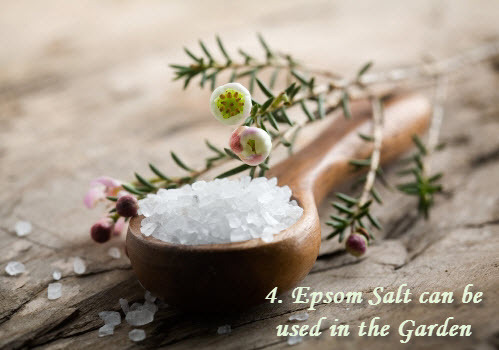 When using this salt for exfoliation, avoid using soap for a while after removing the Epsom salt scrub because it may interfere with the action of the salt. Besides, you can get rid of blackheads by applying a solution of half cup of water mixed with one teaspoon of Epsom salt and three drops of iodine. 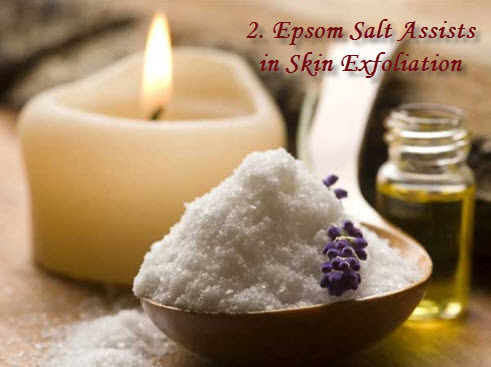 Furthermore, you can add half a teaspoon of Epsom salt in your regular cleansing cream and massage your face with this cream daily at night before going to sleep. Epsom salt has anti-inflammatory properties. Thus, it relieves swellings and inflammations. Moreover, it soothes muscle cramps and pains, and provides relief from sore muscles, sprains, bruises, migraines, gout, bronchial asthma, etc. Soaking in Epsom salt also helps remove splinters as it brings the deep splinter to the surface so that you can extract it. Plus, when dealing with itching due to skin irritants, you can make a compress by soaking a washcloth in a mixture of a cup of water and two tablespoons of Epsom salt. Place this cloth on the affected areas to ease the discomfort. Being rich in magnesium, Epsom salt can be used to nourish your house plants. You can add these crystals in the soil to make the primary nutrients more effective. In addition, you may add about two tablespoons of Epsom salt in a gallon of water and sprinkle it on the lawn to maintain healthy, green grass because magnesium helps with chlorophyll development. 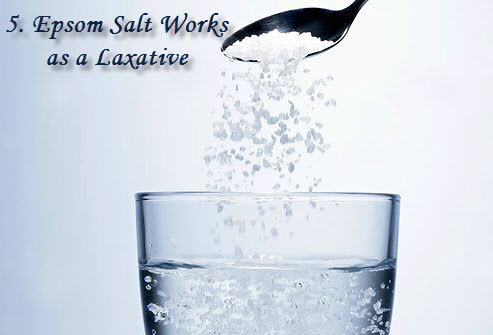 Epsom salt works like natural laxative and relieves constipation when taken internally as increases water in the intestines. 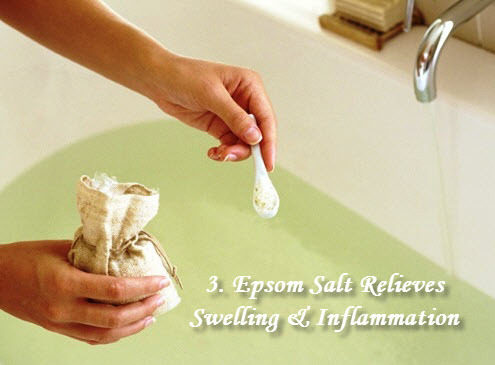 To follow this remedy, you will have to mix a teaspoon of Epsom salt in four ounces of water and drink it. If you do not like the taste, you may add a little lemon juice, too. Do not take more than two doses of this home medicine in a day because it is not recommended to take more than two teaspoons of this mineral compound in a day. Moreover, do not follow this remedy for more than two weeks. 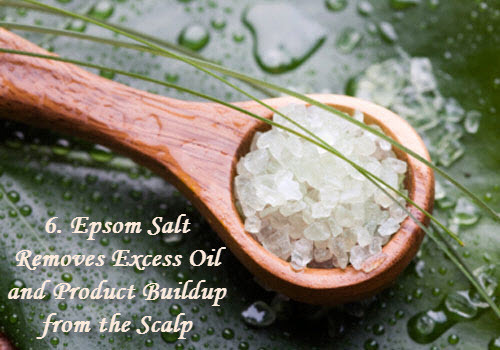 You can use Epsom salt to get rid of excess oil and product buildup from your hair. To prepare this hair clarifier, add one cup each of Epsom salt and lemon juice in a gallon of water. Rinse your hair with this solution before using shampoo. In case you are bothered by greasy hair then mix nine tablespoons of this salt in half a cup of your shampoo before shampooing. You can even mix equal parts of Epsom salt and conditioner, heat the mixture in a saucepan, apply it on your hair, and finally wash it off after 20 minutes. This shall help add volume to your hair. wow.. I’m glad I read this. I did not have any idea how much more Eps salt could do.